The work of surveyor, astronomer, and mathematician Seth Pease contributed to the orderly settlement of Western lands and, in particular, to the Connecticut Western Reserve in Ohio. Beginning in 1789, the year of President George Washington’s inauguration, and lasting several decades into the 19th century, Pease participated in and oversaw several expeditions that converted wilderness into grids of townships and farms. Little is known of Pease’s early life. Born in Suffield in 1764, he was the fifth of 11 children of Joseph Pease Jr. and Mindwell King Pease. Joseph, a shoemaker and sawmill owner, served as Suffield’s town clerk for 38 years and owns the distinction of serving as the town’s first probate judge. Family ties created and sustained both prestige and prosperity for the Pease family. Joseph provided sawn lumber for his second cousin, famed furniture craftsman Eliphalet Chapin of East Windsor. Other family members entered public service and invested successfully in industry and in land in New York State and Ohio. How Seth Pease learned the astronomy, mathematics, and surveying that he employed in charting the new nation’s frontier lands remains an unanswered question. Published Pease family genealogies list Seth as having attended and graduated from Yale University; however, historian Silvio Bedini has found no record of this at Yale. Pease may have acquired knowledge through reading readily available works on these subjects as well as through practical experience. In 1785 he was teaching school in Suffield and operating, with his brother Royal, his father’s sawmill. In that same year he wed Bathsheba Kent. Four children were born of this union. Before and during his survey of the Western Reserve, Pease spent some months in Philadelphia with the nation’s premier astronomer David Rittenhouse, from whom Pease purchased instruments and manuals. Beginning in 1789, Pease was steadily employed in surveying in New York State and in Maine (then a part of Massachusetts). The earliest records left by Pease himself are those from a survey he conducted of privately-held land in Maine in 1794 and 1795. 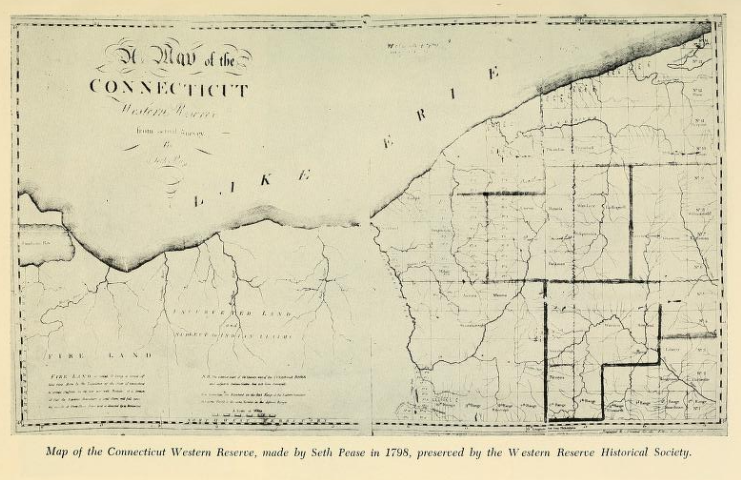 In 1796, Pease was a member of the first surveying expedition to “New Connecticut,” or the “Western Reserve” in Northeast Ohio, a tract of over three million acres of land Connecticut had once owned according to colonial charter and had sold in 1795 to the Connecticut Land Company. This incorporated group of 35 purchasers, after the Treaty of Greenville cleared their claims with the Native American peoples comprising the Western Confederacy, commissioned General Moses Cleaveland, originally of Canterbury, Connecticut, to lead this surveying expedition. Third in command of the expedition, Pease served as astronomer and assistant to Augustus Porter, the lead surveyor who hailed from the Litchfield County town of Salisbury. 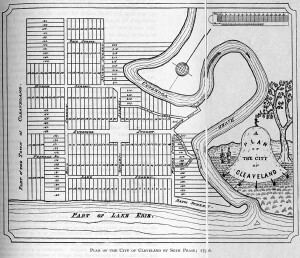 In September 1796 the party surveyed the area around the mouth of the Cuyahoga River; later that year Pease created a corresponding map, the second of the planned city, entitled “A Plan of the City of Cleaveland.” Returning to the region for another season in 1797, Pease served as principal surveyor, overseeing four survey parties. 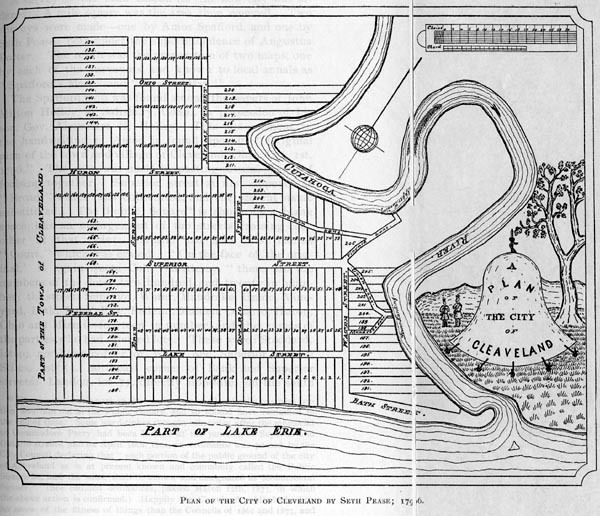 Later that year, Pease drew the first map of the Western Reserve, which was engraved and published in 1798 by Amos Doolittle in New Haven. Pease’s field notes and journals of the Western Reserve survey record not only the matters of measuring and reckoning place but also reveal the many hardships and hazards of frontier travel. Compasses were unreliable, necessitating re-measurement. Survey chains could be mishandled, pulled taut by some crews, held loosely by others. Food and equipment were carried by boat and by animal and stored in shelters constructed for the purpose. In 1797 the team cleared and planted a garden in anticipation of work into the fall. Weather was unpredictable; the expeditions were often beset with illnesses, such as dysentery. Disease and accidents claimed the lives of 7 of the 63 men in the 1797 expedition. Though work in the Western Reserve would continue, Pease carried out surveys of the Holland Purchase in New York State in 1798-99. In 1801, Pease took advantage of his travels between the frontier and New England by conducting a fur trading business. 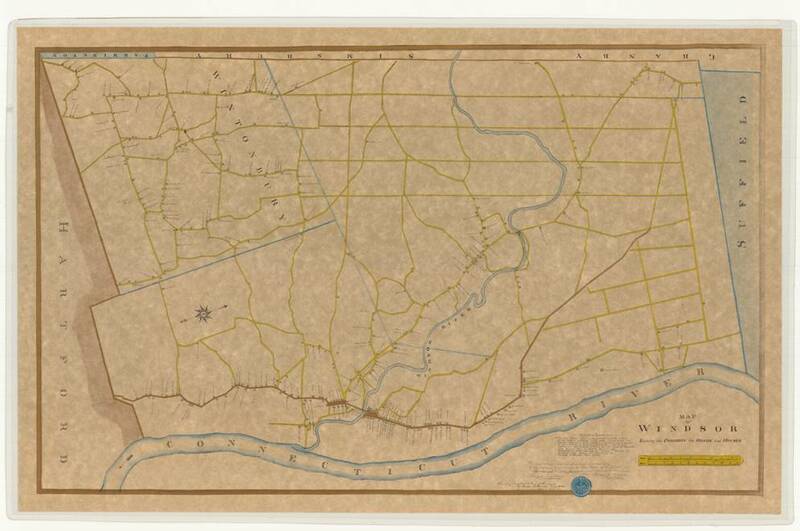 Pease was appointed surveyor general of the Mississippi and Orleans Territory in 1806-07, the same year Secretary of the Treasury Albert Gallatin appointed him to complete the survey of the south line of the Western Reserve. In 1810 Pease was the first to be named to the post of second assistant postmaster general of the United States. At that time, fellow Suffield citizen and lawyer, Gideon Granger Jr., who in 1790 had married Pease’s sister Mindwell, was postmaster general. Doolittle, Amos, and Seth Pease. “A Map of the Connecticut Western Reserve from Actual Survey by Seth Pease.” New Haven, CT: Amos Doolittle, 1798. The John Carter Brown Library, Brown University. Link. Pease, Seth. Journals of Seth Pease to and from New Connecticut: 1794-98. Cleveland, OH: Western Reserve Historical Society, 1914. Link. Hatcher, Harlan. The Western Reserve; the Story of New Connecticut in Ohio. Indianapolis, IN: Bobbs-Merrill, 1949. Bedini, Silvio A. “Seth Pease: Astronomer Surveyor of the Public Lands, Part 1.” The American Surveyor, December 2005. Link. Bedini, Silvio A. “Seth Pease: Astronomer Surveyor of the Public Lands, Part 2.” The American Surveyor, Spring 2006. Link.